Kiss Me in Christmas by Debbie Mason is the sixth book in Christmas, Colorado series but the first that I have read in this series and by the author. In this book, we meet actress Chloe O' Connor who is known as a drama queen and all round despised by the people in her town and after her stunt last year where she blamed her twin sister, Cat, of attempting to murder her, her relations with her family are also on the rocks. Amidst all this, now she has to attend Cat's engagement party and face all the people she doesn't want to face anytime soon. Then she is dreading meeting Easton MacBride, the one boy she ever loved and then lost to her own sister, Cat! With these problems, the drama begins with a healthy dose of romantic differences, some heated glances, quite a few misunderstandings, some fake fainting, small town melodrama, heartfelt emotional play and also plenty of suspense and action that had me sitting glued to the book right till the end! I thoroughly enjoyed reading the book and while this is part of a series, it can be read as a standalone. However, despite this, I think it is better to read the books in order because characters and story lines from previous books are used in this one and had me wishing I had read the previous books first so that I could understand the undercurrents better. Debbie's writing style is fluid and she had me engaged all through the story. Her portrayal of a small town is so very realistic with gossipy neighbours, troublemaker old women and old grudges that still spice the everyday life of the residents. I enjoyed meeting the MacBride and O'Connor family. They are a varied bunch and sometimes very irritating and other times so lovable with their loyalty and love for each other. I felt sorry for Chloe who has been misunderstood all her life and feels that no one loves her which does seem true several times. She loves her family and despite their not-so-good-opinion about her, still tries her best to do right by them which often leads to more trouble. Poor her! Easton MacBride started out as a jerk and I didn't like him very much but later on when I started getting to know more about him, he came out as a caring, responsible and protective lover and his romance with Chloe had me smiling through my tears, feeling sorry for Chloe for all the years she lost and angry with everyone including Easton who didn't believe in Chloe earlier. I didn't like Cat. She comes out as an attention seeking, unhelpful sister and I think I will have my judgement reserved on her character until I read the previous books which I am told will help me understand her and Chloe's relationship dynamics better. Chloe and Cat's mother came out weak and as a biased parent and I just don't like such people who don't know their own children and take sides. She didn't know Chloe one bit and it was kind of sad. I loved meeting Ty and Estelle and their unflinching support to Chloe. I laughed at their plotting attempts at matchmaking and then attempts to better Chloe's reputation! The story is fast paced and so beautifully brought out on paper that it had me totally invested in the characters' lives and hooked to the romance, wanting to know more what happened next. 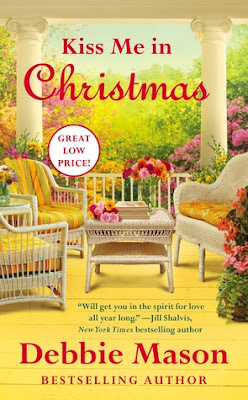 All in all, Kiss Me in Christmas by Debbie Mason is a complete package with a heartfelt story, genuine characters that are flawed, a whole bucket load of drama, passionate romance and action. 4.5 out of 5 to it and recommended to all romance lovers. After this book, now I am eager to start on the previous books and get to know more about this town and its very colourful people even more while I wait for the next book in this series. I received an ARC from the publishers and the tour organizers via Netgalley and I am very thankful to them. The above review is my honest and unbiased opinion and in No way influenced. Chloe barely registered what Easton said because a lightbulb went off in her head. Her sister's old flame was the answer to her prayers. She opened her mouth to lay out a win-Cat-back plan to Easton and inhaled an excited breath. She choked on the Scotch. "Jesus," Easton muttered with an irritated look in his sapphire-blue eyes as she coughed and sputtered. He came down the front steps and patted her back. She teetered on her heels, raising her hand to get him to stop with the forceful slaps. "I'm okay," she wheezed. The man didn't know his own strength. He was built like the star quarterback he'd once been in high school--thick neck, wide shoulders and broad chest, narrow hips and the tightest behind this side of the great divide. Actually, since he stood in front of her, she hadn't gotten a look at his behind. But she didn't imagine it had changed since she'd last seen him naked. His seven-year stint in the military had only served to further strengthen and harden the man. Her four-inch heels put her eye level with his strong chin; the cleft she used to delight in kissing barely visible beneath the dark scruff. She lifted her gaze to his beautifully shaped mouth; the hint of a bow in his upper lip, the bottom sensually full. His perfect lips flattened. She briefly closed her eyes and released a disheartened sigh. Easton McBride would never be the answer to her prayers. Debbie Mason is the USA Today bestselling author of the Christmas, Colorado series. Her books have been praised for their "likable characters, clever dialogue and juicy plots" (RT Book Reviews). She also writes historical paranormals as Debbie Mazzuca. Her MacLeod series has received several nominations for best paranormal as well as a Holt Medallion Award of Merit. When she isn't writing or reading, Debbie enjoys spending time with her very own real-life hero, their four wonderful children, an adorable grandbaby, and a yappy Yorkie named Bella.